Eco-Explorers summer camps are nature-based, experiential STEAM-centered camps for your young explorer. Camps are available for ages 4 - 7 from 9 am to 1 pm and ages 8-11 from 9 am to 4 pm. Aftercare is available for 4 - 7 year olds from 1 to 4 pm for an additional $14/day. Quality educators, daily outdoor adventures, and excellent curricula make for the best summer camp ever. Your child will love exploring nature with us! Registration opens March 29th. ​The Museum of Northern Arizona's Discovery Program is a gateway into the wonders of the Colorado Plateau. Taught by experienced educators, these programs offer an exciting range of hands-on learning opportunities about the region's traditions of fine arts, natural sciences, Native cultures, and ecology. Small class size allows maximum interaction between educators and campers. These activity-based, week-long day camps meet Monday through Friday from 9 a.m. to 3 p.m. with graduation and family activities on Friday evening. If creepy crawlers fascinate your child, then NAU’s summer bug camp is an ideal summer activity. The Colorado Plateau Museum of Arthropod Biodiversity will host two week-long summer camps for children ages 6 to 10. Campers will learn about insect natural history and biodiversity through a series of fun project and activities. Campers collect insects and create their own insect collection, build their own bug, and we finish the week with by preparing and sharing insect cuisine with invited family members and friends. The first camp with take place Monday, June 17, through, Friday, June 21, and the second camp will take place Monday, July 8, through Friday, July 12. 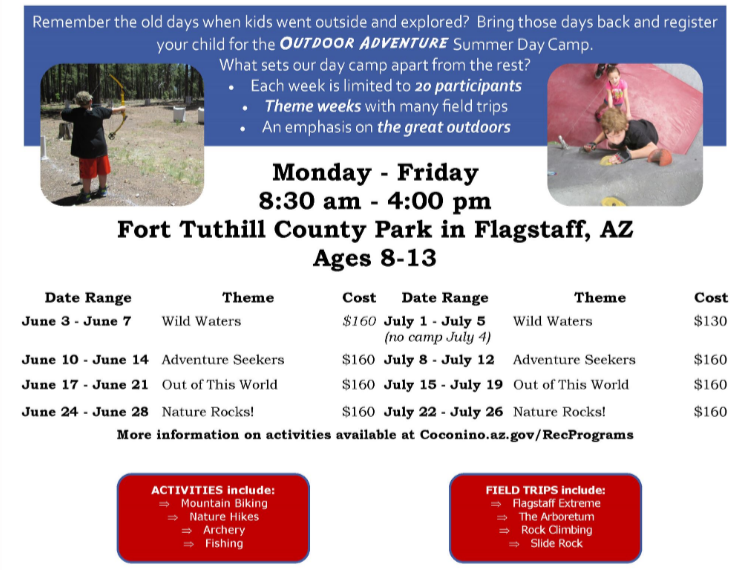 Both camps run from 9:00 AM to 4:00 PM and will be held at Willow Bend Environmental Education Center, Flagstaff, Arizona. The School of Forestry offers environmental education camps for children ages 9-16. The vision of the Centennial Forest Environmental Education Programs is to have fun while connecting kids to the forest and the natural world. Through these forestry programs, campers gain the knowledge to teach others about environmental stewardship, land ethics, and forest health and experience the world in a new way. Did you know that different forests will have different types of forest fires? In this interactive and hands-on camp, campers will learn the “fire story” of our local forest by learning about the trees and plants, how fires burn (combustion! ), fire behavior (how fire moves and why), and even the effects of weather on a forest fire. We will explore how dendrochronology (tree rings) help us to understand the history of fire in our forest. Campers will also learn how to make their homes safer in a wildfire event. Students who have completed grades 6-8 are eligible. We are looking for 12 adventurous students who are interested in learning about Arizona’s watersheds, how they are used as natural resources, the recreational opportunities they provide, and action needed to preserve them. During the five days, we will be exploring Northern Arizona through day trips to Lake Powell, Lee’s Ferry, Oak Creek, Verde River, and McHood Reservoir. Expect to record your adventure through a field journal filled with facts and art! Each day will start at 7am and end between 5-6pm. . For course continuity and success, students are expected to attend the entire five days and pay the fee of $420. We are looking forward to exploring Northern Arizona with your student this summer! Contact Tony Cola at tonycola@fjacademy.com or Stephanie Jackson at stephaniejackson@fjacademy.com for more information! Are you between 3rd-5th grade, interested in learning about Science, Technology, Engineering, or Math, STEM? OR are you in 6th-8th grade, excited to learn more about STEM and be a mentor? If so, then this camp is for you! We will spend the week doing hands-on activities, collaborating and empowering each other as a group, getting curious about the natural environment, and having fun! The last day of camp, we will take a field trip to the Science Center in Phoenix. The camp will max out at 27 participants, sign up soon! We’re excited to explore STEM with you! To learn more, contact Stephanie Jackson, stephaniejackson@fjacademy.com or Heather Berginc, heatherberginc@fjacademy.com. Come feel the exhilaration of whitewater, hike through ancient canyons, challenge yourself, make new friends, and explore the Southwest! You will build relationships with youth from across the nation. Financial aid is available. We have been providing exceptional multi-day outdoor learning opportunities for more than 20 years.